Winter is coming to an end and so is my "29 AA Flatbed project. I have the rough sawn white oak boards from my brothers central Minnesota woods cut 4 years ago, ran through the saw mill, dried for a few years, and now planned and grooved for the bed strips. Finish sanding will happen this week, then it is time to make the decision on the finish for these boards. The main sill beams were primed and painted green body color like original, but these floor boards look too nice to paint. I believe I have ruled out a shiny gloss epoxy or polyurethane finish because of the issues with scratching if I ever haul anything other than pillows or cotton balls. So that leaves oil finishes like linseed, kneats foot, or tongue oil. The other option I was considering is some of the deck stains, clear wood finishes, or Thompsons water seal. In reality this truck will be garage kept probably the rest of it's life and will never haul rocks or gravel, but still I am considering my options. I am interested in what others have used and how it is holding up. 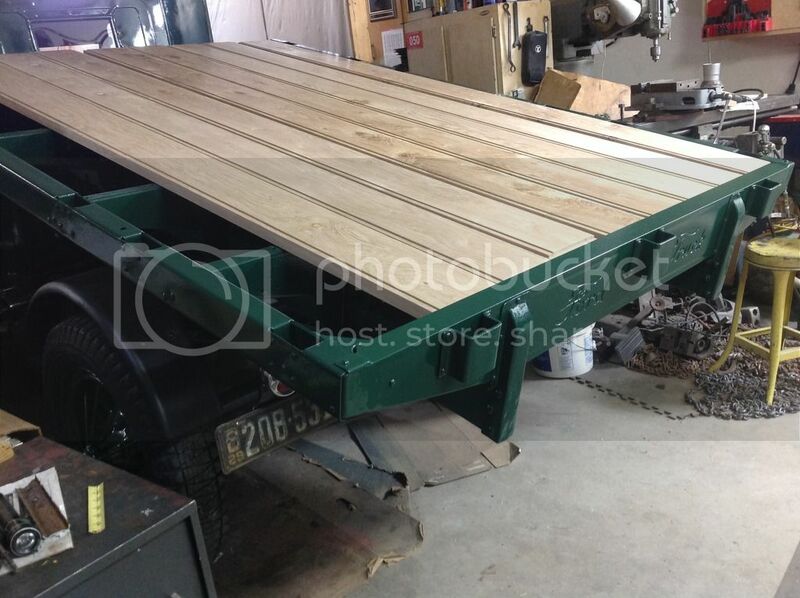 Re: Flatbed Board Finish Options. I had similar feelings when I did the deck on the 31. I didn't want them shiny as I planned to use the truck. I did not want them to rot out either. I did not like the look of the Fir timbers as the were a bit too light. I stole and idea from Chip Foose and stained the grain with some cheap black spray paint and a rag. Finished that off with copious amounts of Linseed oil. I took about a week of soaking it in oil to get a good amount into the timbers. After a year it still looked ok when I had a mis-hap with some used motor oil spilling on the deck. this of course stained the deck much darker permanently. Seeing as I had more used oil anyway I painted the entire deck to match the stained area. Soaked in real good and now my working deck looks just like that, a working deck. I no longer worry about it at all, and some still ask what stain I used to make it look that way. I did white oak exactly as you have done with your bed wood. After sanding I used a 50/50 mixture of boiled linseed oil and turpentine. Do not use any more than 50% linseed oil as it may remain sticky. You can go 60% turpentine if you like. After getting a couple of coats onto the wood and letting it soak in for a few days give it a rub down with 0000 steel wool, blow it off and then in preferably warm conditions give the wood several coats of Johnson's Paste wax. From then on give it a coat or possibly two each year depending on how much you get it out and about. If you do get a scratch you can give the scratch a rub down with steel wool soaked in the paste wax to buff it out. I did mine this way 6 years ago and it has held up really well and lets the beauty of the wood show. White oak is just too pretty to paint. I'll post some pictures of mine a little later. The turpentine will stink like heck for a week or so but it dissipates. Remember to lay your rags out flat to dry because if left crumpled up in a wad they WILL GET HOT and ignite burning your shack to the ground. The big mistake I made on mine was assembling the sill pieces and the bed wood to the box and then mounting it onto the truck. Had to lift it off saw horses, turn it on its side, maneuver it through a standard door and lift it up and onto the truck. Took me, my brother, two sons and my wife to make the move. We all just about blew hernias doing it.... never again. That white oak is HEAVY!!! Sorry about the delay in getting this picture posted. Oak is the wrong wood to use on a bed, unless it is sealed completely it will cup and warp in the weather over time. Many people seem to use oak for exposed use but it was never used for that purpose. Yellow pine, maple would be the better material. MY life anyhow. I am also getting a thrill out of using wood that was growing on the family farm just a few years ago. My plan is to seal the boards completely with linseed oil, then every few years reseal the top surfaces as needed. This whole 5 year truck project was made easier because of helpful fellow AA ers. If spring ever gets here in northern Minnesota, I am anxious to get out on some of our non crowded back roads and act like it is 1929.